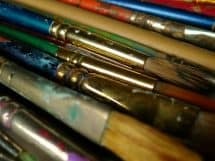 In my recent post on 7 Summer Break Tasks for the Homeschool Mom, I mentioned the job of curriculum planning. Now, if you’re like me, you feel like you’ve just barely finished the school year, and you don’t even want to think about planning curriculum yet! 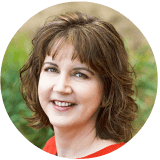 But there are some impressive homeschool moms out there who want to get started now (don’t even talk to me about the ones who are already done! 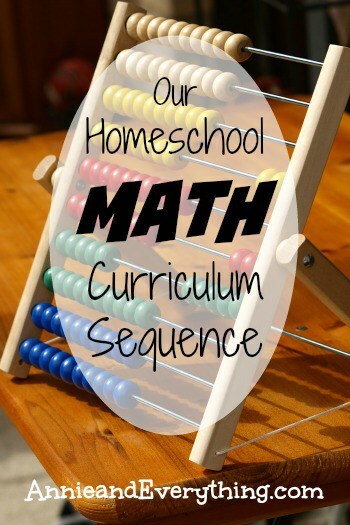 ), so I thought it might be a good idea to share our homeschool math curriculum sequence – i.e., the math books we’ve used over the years as our children have progressed through homeschool. At the beginning, when the eldest was starting kindergarten and first grade, the big item on my wish list was the Saxon manipulatives set to go along with their math curriculum for those years. Wow, I wanted that thing pretty badly – because everyone said that using manipulatives was the best way to learn math. But guess what? That manipulative set was stinkin’ expensive! Woo howdy! I didn’t have the triple-digit sum they wanted me to shell out for that thing – and this was 15 years ago; it must be even worse now. So I bought something else (see below) and made do for awhile. Amazingly enough, over time (as I was never able to save up enough money for that manipulative set, lol), I discovered that we could make do with a few items around the house. And most of the other things, we didn’t really need, anyway. And I came to the conclusion that using manipulatives for math is an over-rated concept. 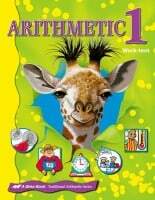 Grades K-3: Abeka Math Workbooks. Guess what – these are very reasonably priced, especially if you don’t buy the accompanying teacher’s materials. Who needs them at this level? I think we can all add the numbers in our head at this stage in order to check our child’s work. Abeka may very well offer manipulatives, but I never bought them. We used Legos or dried beans when necessary, which wasn’t very often. These workbooks are cute and colorful. There is plenty of space for young hands to write big numbers. Kids can even work independently, because there are age-appropriate explanations of each new skill. There is also repetition and review sufficient to keep the child proficient at prior skills. Grades 4-8: Saxon 5/4, 6/5, 7/6, 8/7, and Algebra ½. I think in the homeschool world you either love Saxon or you hate it. I happen to love it – although for these years only. Before these levels, you have to do the whole manipulative thing. After these levels, Saxon does something weird with Geometry and Algebra by combining them into the same course. I don’t like the way that looks on a high school transcript. But for the later elementary and middle school years, Saxon is the bomb, in my opinion. John Saxon was one of the pioneers of the perpetual review concept, which now is considered fairly standard, I think. It makes sense that you would keep a child practicing everything he has done before – but it didn’t used to be that way. In my public school classroom we would finish a chapter on fractions and go on to decimals — and never see the fractions again. In the Saxon books, the child deals with all types of numbers in the same problem set. Gotta love that. Again, it is thoroughly appropriate for independent learning, because the explanations are very readable by the student. The other thing I LOVE about Saxon is that it is NOT a workbook. The child must show their work on a separate piece of paper. I think this is VERY important when learning math, y’all. Kids need to learn how to line up numbers before adding them. Kids need to learn how to copy problems correctly, to write numbers without mixing up the digits. Kids need to learn how to do math NEATLY, how to organize a page of work, how to show the answer clearly. These are important skills – almost as important as the actual math itself – and these years are the perfect time to learn them. And yes, we do both Saxon 8/7 and Algebra ½ (which is considered to be a pre-algebra text, from what I understand). I’ve read that they are very similar and so it is not necessary to do both – I say give the kid as much opportunity to solidify general math concepts as possible before moving on to real Algebra or Geometry. They need to have those procedures in their head so thoroughly that they don’t have to think about them any more, so that the very new and abstract concepts of Algebra and Geometry can be given their full attention. It is very difficult to learn Algebra if you still struggle with general math. Depending on your child, you may be finished with the sequence up to here by the end of either seventh grade or eighth grade. In our family, we skipped the Abeka Kindergarten math book and went straight to the first grade book while still in kindergarten. That meant that my kids were ready for Algebra I in eighth grade. If your child is taking Algebra I in ninth grade, that is totally fine. Many colleges do not require four full years of high school math, anyway. For more about that, see my post about The Easy First Step for High School Curriculum Planning. Grade 9 or 10: Geometry, by Harold R. Jacobs. Why mess with a good thing? The Jacobs Geometry is just as great a textbook as the Algebra one. Again, the kids used this mostly independently; they asked me when they had a question or couldn’t understand something. But that did not happen very often, which tells me that these two textbooks did their job. I don’t have the time to sit with my kids and learn every lesson with them. Buying a textbook like this means that I don’t have to — which is why I say that homeschooling high school is not as hard as many people think it’s going to be. Grade 11 or 12: Precalculus, by Lial, Hornsby, and Schneider. 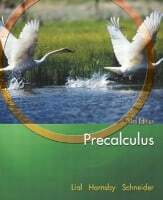 We had such success with the Lial Algebra 2 that we used her textbook for Precalc also. As the student reads the explanation for each lesson, there are guided problems to solve. Then a full exercise set for independent practice. My kids worked through EVERYTHING independently; then I graded their tests. We also purchased the Student’s Solutions Manual so they hardly ever had to ask me much of anything. Pretty handy! Again, get an older edition that fits your budget. None of my kids has made it to Calculus in high school. I did find a copy of Saxon’s Calculus at a curriculum sale for not much money, so I snatched it up. My son might get there; we’ll see. If we use it, I’ll let you know how it goes. This math curriculum sequence has been successful with three graduates up to this point. I think that means it’s tried and true! What’s your favorite math curriculum and why? 3-6 grades, Singapore Primary math, US Edition, not the new common core edition. It gave her a solid foundation. 7-9th grades, Teaching Textbooks pre-algebra, algebra, algebra 2- we didn’t use the on-line grading, she had to work out all the problems on paper and we went over it together. Any mistakes she made she corrected. We use the same Saxon sequence you do–including doing both 8/7 and Algebra 1/2. It’s working well for 3 of my kids, and I hope it will keep working. I’ve discovered that not much is needed before starting Saxon 5/4 because my kids pick up the math naturally by living and playing and working. I mess around with Life of Fred and cheap workbooks from the dollar store just for fun, but I’ve dropped all formal early math work. One of my daughters loves MathUSee–the clean pages are imperative for her to be able to focus and stay focused. Thanks for the Algebra and beyond suggestions! Yes, you’re right; I think if I had it to do over again I wouldn’t stress out so much about early math. We’d learn multiplication tables with songs, for example. (Maybe I should still get that going for my older kids, lol!) Thanks for stopping by, Anne! Thank you for sharing this post. We have completed Saxon 54 and 65, though both were an abridged version. We are starting Saxon Math 76 this month, and plan to be done by this summer. I am curious why you decided to stop using Saxon Math after Algebra 1/2. I feel like we will be at Algebra 1/2 in a blink, so I am trying to plot our course. Thanks so much. Great question, Shannon. Saxon does not have a separate Geometry course, they just incorporate Geometry into their Algebra 1 and Algebra 2 books. While I can see there might be benefit in that, I wasn’t sure how I would put it on a transcript. 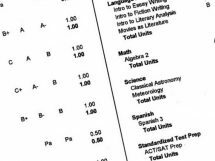 I didn’t want to have to try to convince colleges that my child had in fact had Geometry. I’m sure there is a way to deal with it; I just didn’t feel like messing with it. And I felt it was a good opportunity to expose my kids to a different type of curriculum, also. Not everyone does things the Saxon way, lol, and they might as well learn that at some point. Thanks for stopping by! Wow! I must say. 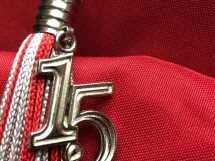 After months and months of planning, internet searching, calculating prices, curriculum search, etc., I was on the verge of a breakdown thinking about what to do for HS. Reading your post has given me the confidence and sanity to continue homeschooling. Thinking I would not be able to pull this thru, I almost sent my kids to regular school. Thank you so much for your time and dedication to write all of this information. Homeschooling mom. Of 4. Thank you so much for all this helpful info! 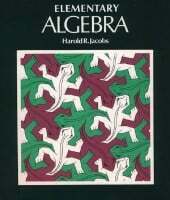 I do have a question about the Jacobs Geometry and Algebra. Is it difficult to find a matching answer keys? That’s what I’m unsure of. Is the teachers edition the same as answer keys? Thankyou. It wasn’t difficult when I bought them, but it might be more so now. I would definitely look for ones that are the same edition. So if it’s a second edition textbook, get the second edition teachers’ guide. And for Algebra, yes, the teachers’ guide has the answers in it. For Geometry, it might be JUST an answer key — and in that case, don’t look for the teachers’ guide also, because you really don’t need it. The tests are in a separate book altogether, though. So that’s three things to buy — textbook, tests, teachers’ guide/answer key. We have been using Saxon since day 1 (5/4). My oldest is in the advanced math book now, and we still love Saxon! I like Math U See! I used Saxon for my older kids but it’s not a good fit with my younger kids! Great to hear, thanks for the input!